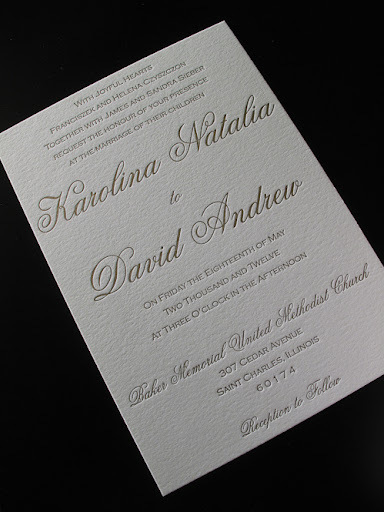 Karolina and David tied the knot back in May of this year. 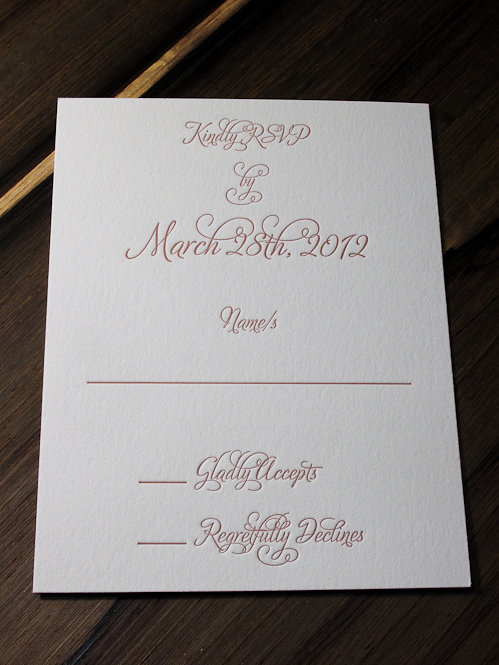 I am so glad I was able to take part in their wedding and print their invitations. 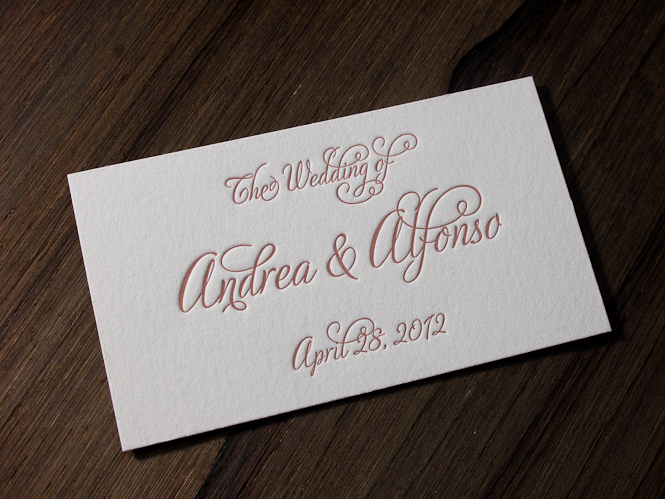 From one newlywed to another…congrats! 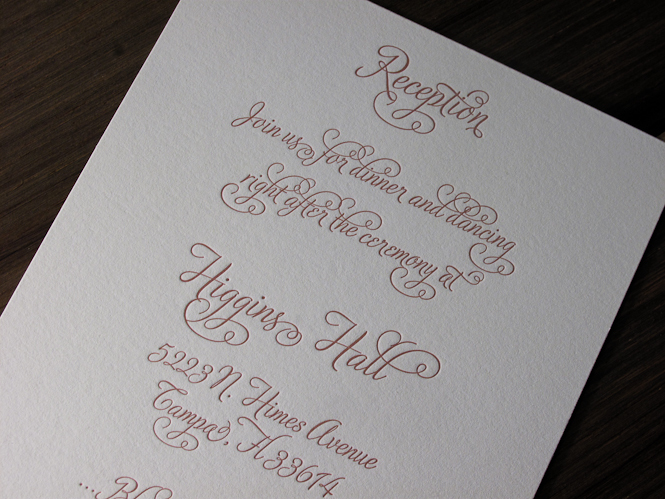 We printed a very elegant 1-color print with Gold Ink for her invitation suite. 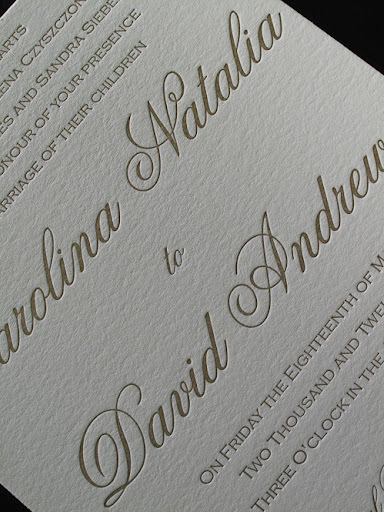 I love printing with Gold because it’s just not something you work with everyday. 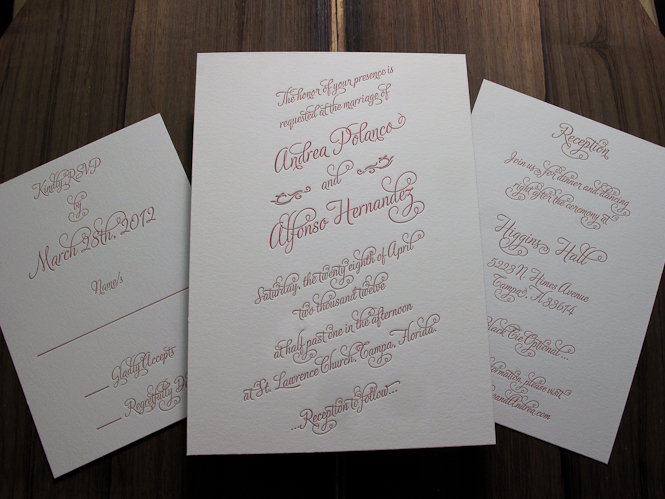 Putting it onto the Chandler and Price and watching it ink up was just beautiful! 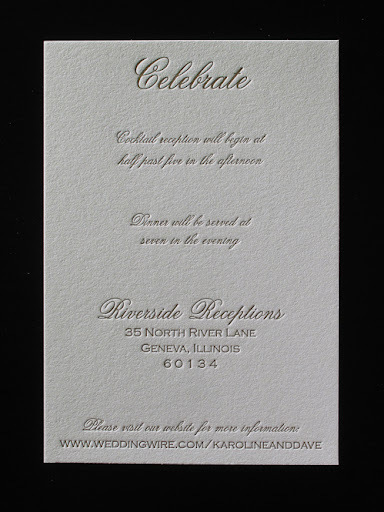 The invitations were printed on the 220# Pearl White cardstock and the additional cards were on the 110# Pearl White. 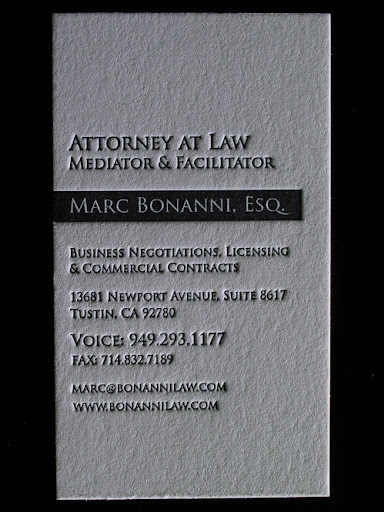 I love the simplicity of his cards: black and white, simple, clean. 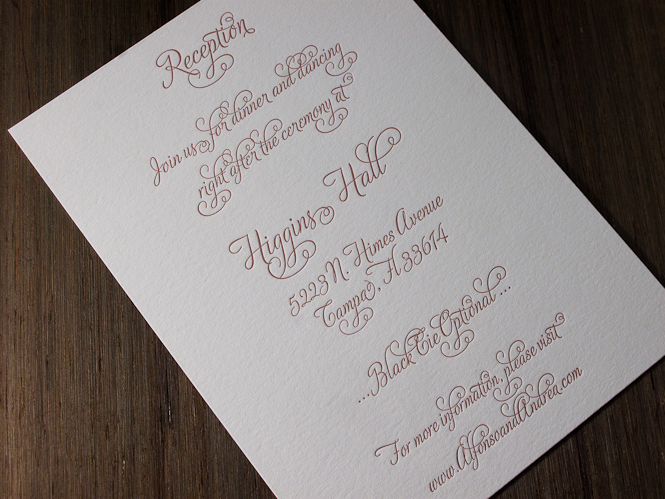 This was printed on our 220# cardstock, so I was able to get a deep impression which I just absolutely love. You can see from the photos that this was pressed pretty deep and it feels so good on the fingertips! 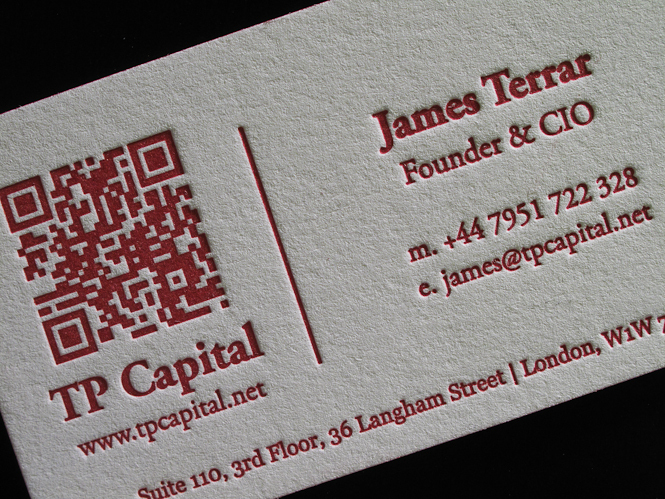 QR codes have been popular and popping up around everywhere lately it seems. 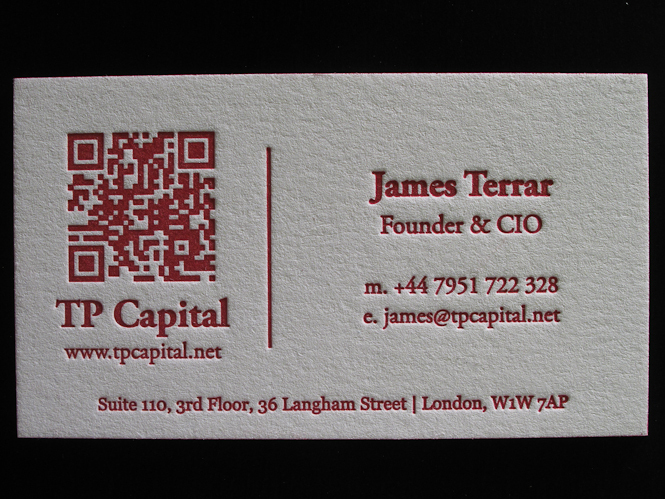 They’re so cool and such a fun concept that I wanted to incorporate that into James Terrar’s business cards. He’s from London! How cool is that, right? I hope I can make it out there someday. One of the many destinations on my list of places to visit. 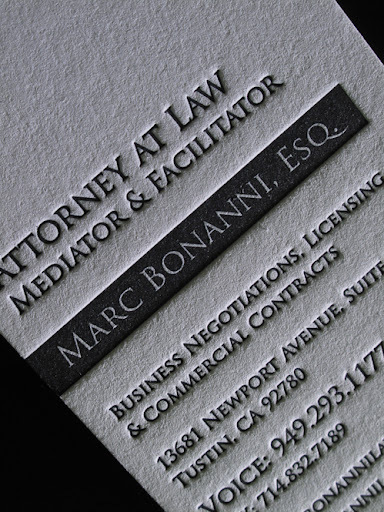 He was a real joy to work with and was very open to different designs. This was my favorite. 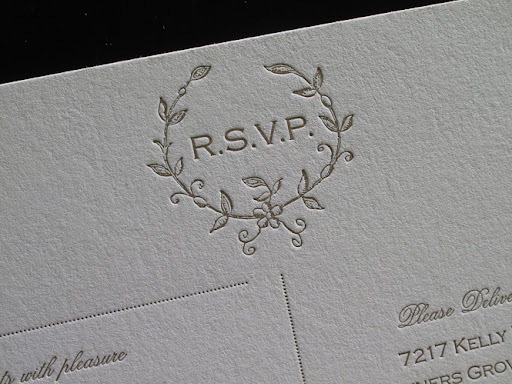 Classic, clean, and simple. Of course I had to add that pop with the edge painting. I totally love that burgundy color! 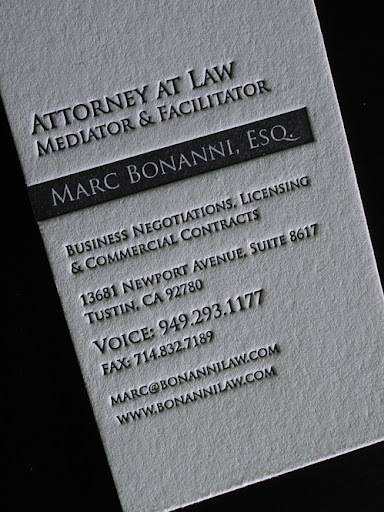 I printed these on our 220# pearl white cardstock. 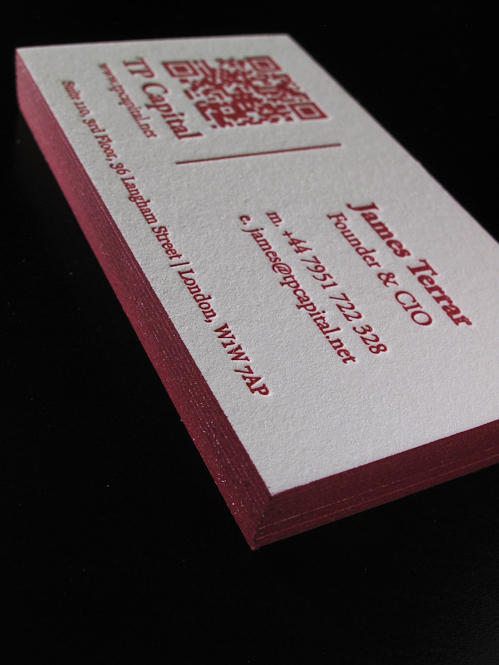 I love the feel of a letterpress business card. 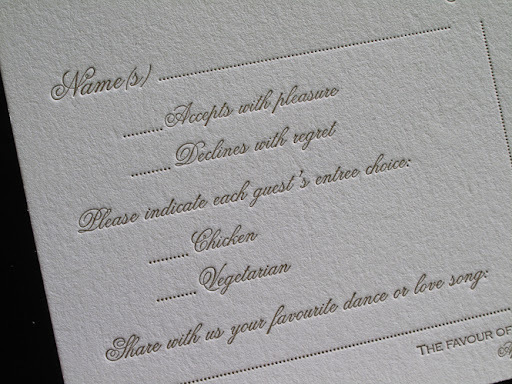 Actually, the feel of letterpress anything to be more exact! 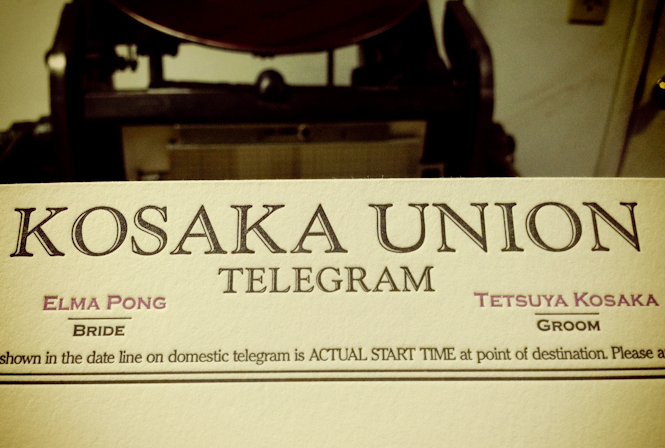 Here’s a sneak peek of our letterpress telegram wedding invitations printed on our Chandler & Price. 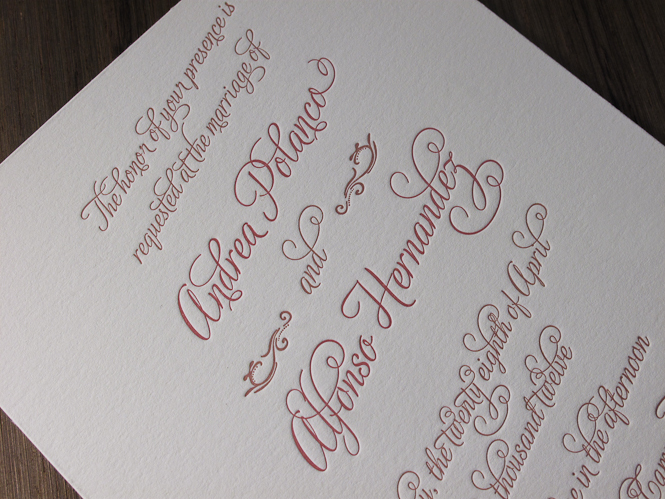 I had the pleasure of working with Andrea Polanco, a soon-to-be bride such as myself. 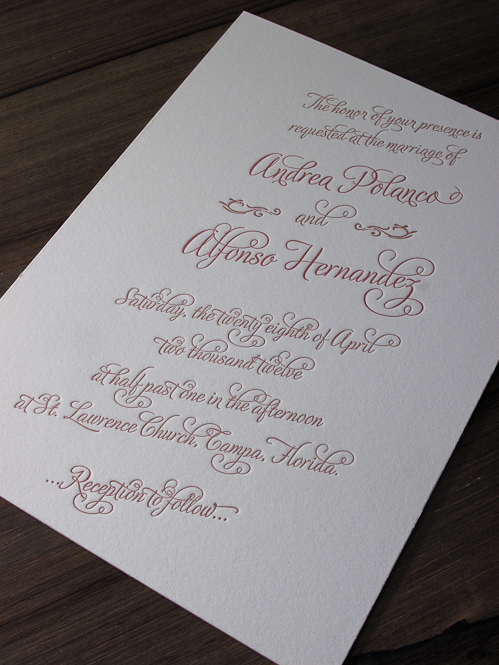 I loved her elegant design of the invitations and the brown and pink just went hand in hand. 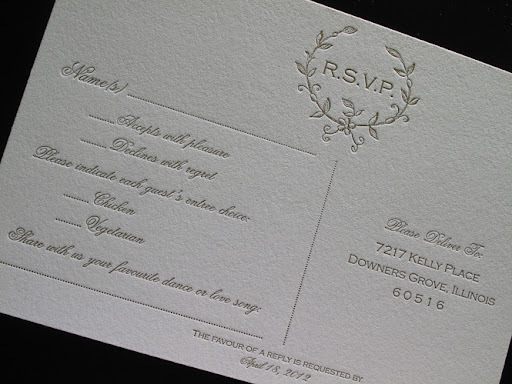 I duplicated her design in illustrator so that the image quality was good in order to get the plates made. 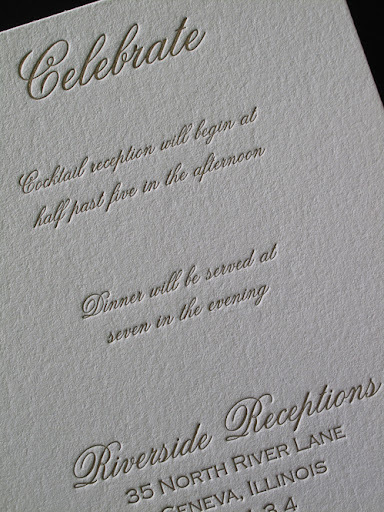 Her invitations were printed on 220# pearl white cardstock and the reception card, response card, and tags were printed on 110# pearl white cardstock. 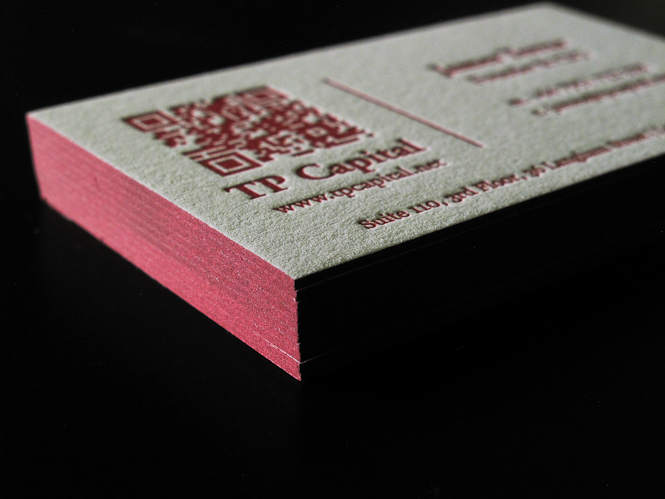 I made the tags 2″x3.5″ so she had the option to leave them as is or reshape them.